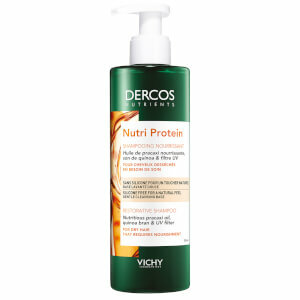 Quench dry, thirst hair with the Vichy Dercos Nutri Protein Shampoo; a cleansing formula with a unique combination of natural, restorative nutrients that is specially developed with UV filters to combat dry hair and scalp caused by heat and photo-damage. Fortified with Vichy’s signature mineral-packed thermal water, the shampoo unleashes the powers of omega-rich Pracaxi Oil and nourishing Quinoa Bran to nourish hair follicles, leaving even the driest hair silky soft and hydrated. Hair feels smoother with broken strands and split ends treated. Apply to wet hair, creating a lather. Rinse thoroughly with water, avoiding eye area. Follow with conditioner. 1144797 H Aqua/ Water Sodium C14- 16 Olefin Sulfonate Cocamide MEA Glycerin Cocamidopropyl Betaine Glycol Distearate Sodium Chloride Sodium Lauroyl Sarcosinate Hexylene Glycol Benzoic Acid Carbomer Chenopodium Quinoa Seed Extract Citric Acid Coco-Betaine Ethylhexyl Salicylate Glutamic Acid Hydroxypropyl Guar Hydroxypropyltrimonium Chloride Pentaclethra Macroloba Seed Oil Polyquaternium-7 Salicylic Acid Sodium Benzoate Sodium Citrate Sodium Hydroxide Tetrasodium EDTA Tocopherol Parfum/ Fragrance.